We loved it so much, we decided to stay. SweetArt, is maintaining a presence in Fulham, London. Browse the SweetArt website and if there's anything you would like to see in person, get in contact. SweetArt was delighted to be at the Henley House and Garden Show as guests of the fabulous T-London. 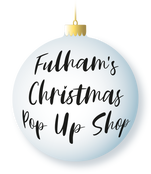 Following on from the Country Living Christmas Fair, SweetArt was invited to exhibit at The Showroom Presents, in Fulham Broadway during December. This new rolling popup shop showcased an exclusive and eclectic mix of designer merchandise which we were delighted to be part of. 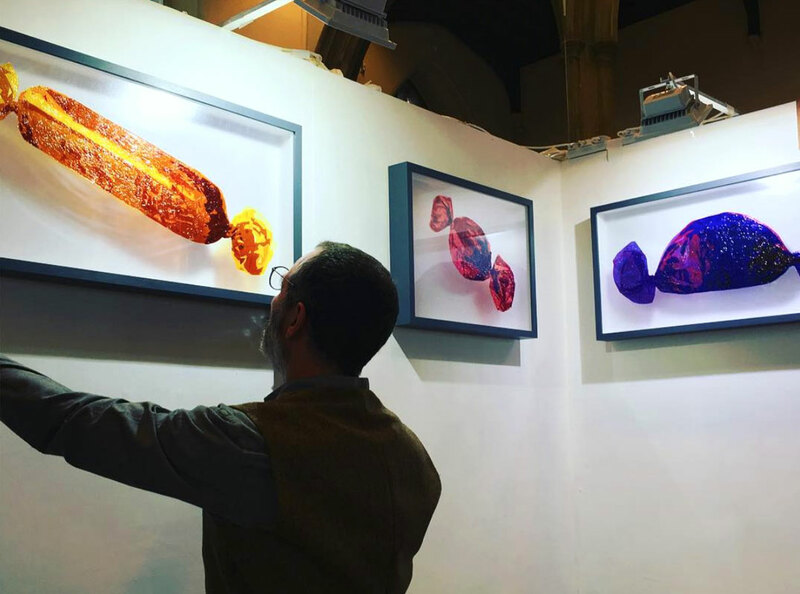 SweetArt exhibited at Art Fair East in Norwich in November 2018. We were delighted to be selected and featured in a live interview on BBC Look East on the night of the private view. 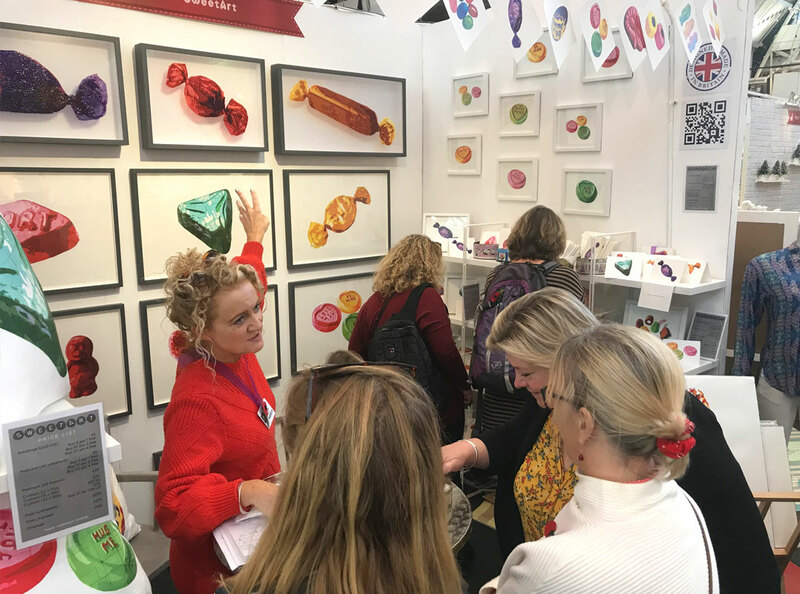 SweetArt decided to try out the world of the Country Living Christmas Fair in November 2018 where three brand new SweetArts were displayed for the first time, along with limited edition hand painted prints, festive cushions and cards. The response was amazing. SweetArt enjoyed its debut at the fantastic Affordable Art Fair in London (October 2018) represented by Ingo Finke Gallery. 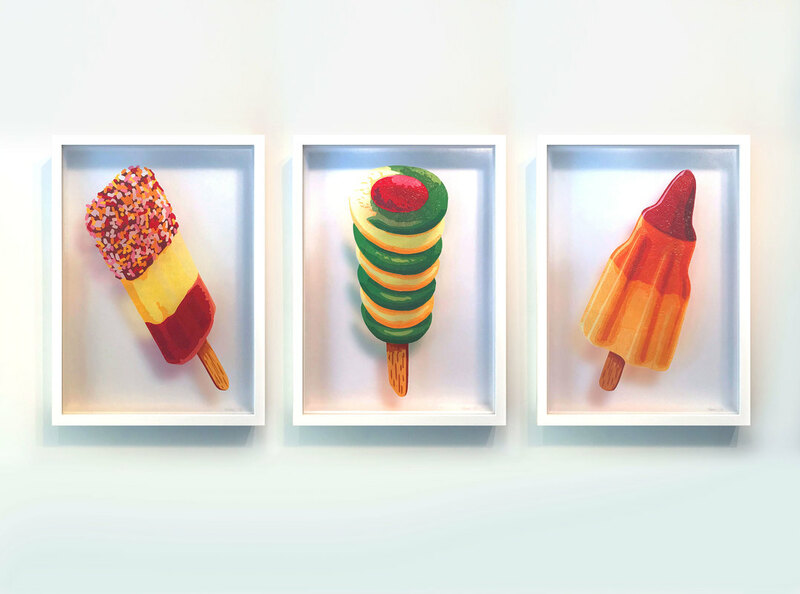 The ice-lolly trio (Fab-U-Lous, Tornado and Zoooom) sold on the first day and Simon Dry was immediately commissioned to create three more. Sweet! 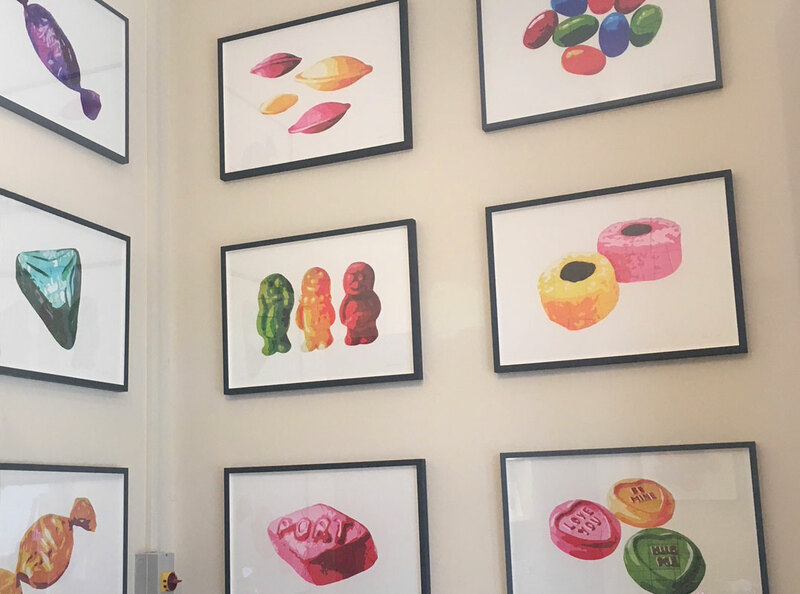 An opportunity came along to Pop Up in Bury St Edmunds which allowed us a space to showcase all SweetArt merchandise and get valuable feedback. For a first ever exhibition at the Brick Lane Gallery Annexe (in November 2017) with no press coverage or social media promotion, to sell 9 out of 10 SweetArt originals is a remarkable achievement. 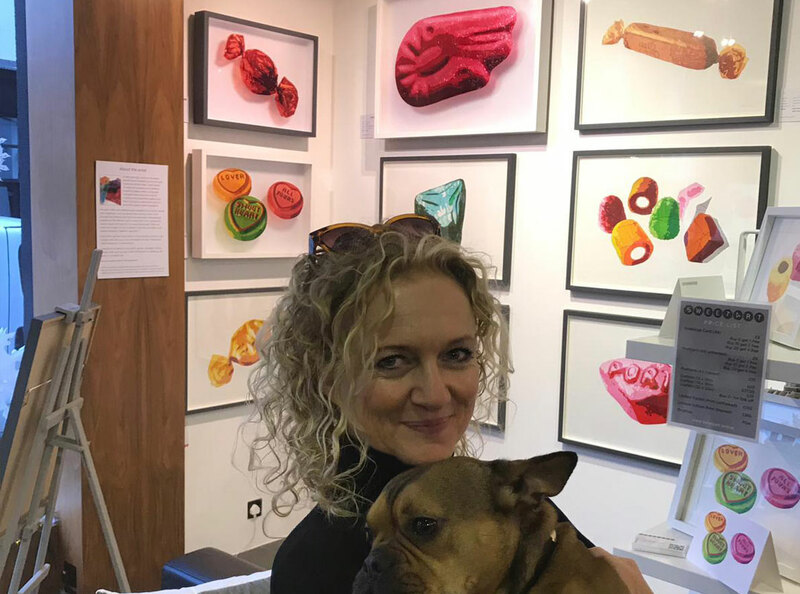 The private view was packed and visitors included Claire and Clive Mackintosh (of Mackintosh's, previous manufacturers of Quality Street), who purchased two of the original pieces plus a limited edition print. Five other originals sold that evening and one more on the Saturday, which was amazing! 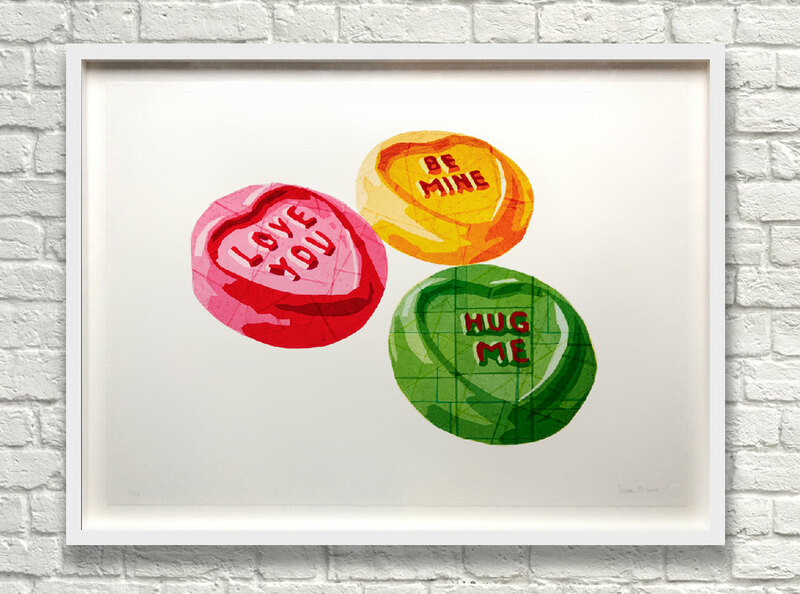 The ‘For You’ (Love Hearts) original could have been sold five times over but it was a case of first come first served! 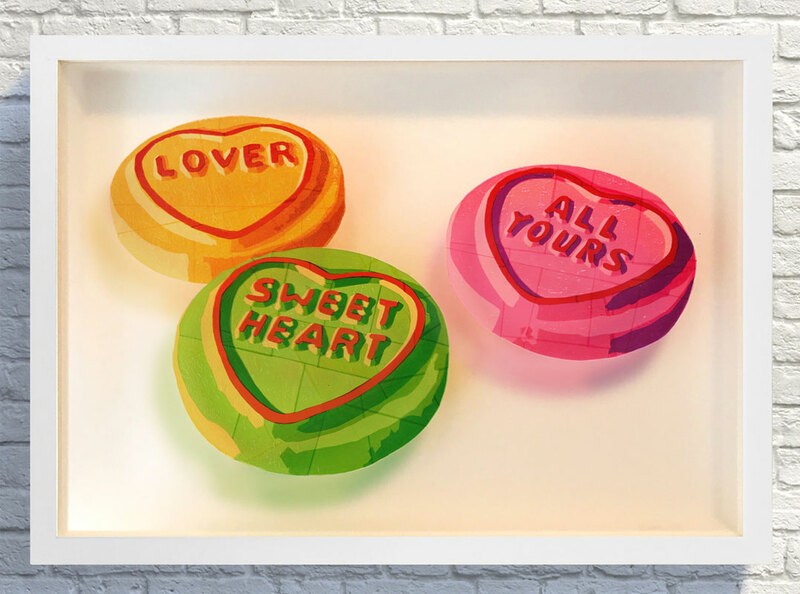 The limited edition Sweet Art prints were also popular, again the ‘For You’ (Love Hearts) image being the most sought after. And the postcards flew out! We were amazed and delighted that so many people turned up on a cold November night to support us at the private view and on the following days. Big thanks also to Pins and Pablo, who dropped in to the gallery and gave their valuable time and advice, you guys are brilliant!